We really haven't gotten any rain to speak of as of yet and, whereas I thought today would be much wetter and damper, it's not the case. In fact, it's just as beautiful as previous days have been this week. Great for recreating, but really not ideal fishing weather for May! We do have a good chance of showers tonight and tomorrow according to NOAA, but we'll have to just wait and see what transpires. Aside from rain, Sunday and Monday night will get really cold, dropping into the low 30's Monday night...cover up those gardens! With the combination of little to no humidity and bright sunny days, we haven't seen many fish rising on the surface since the bugs don't need much time to dry off and take flight. A smart fish knows when to leave well enough alone and will instead key in on easier meals below the surface. 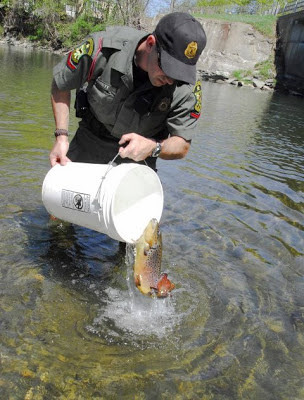 We've seen handfuls of 9-11 inch wild rainbows in the mainstem Lamoille, but not promising numbers by any means. These fish need the help of all anglers in order for their numbers to rebound to healthier levels. 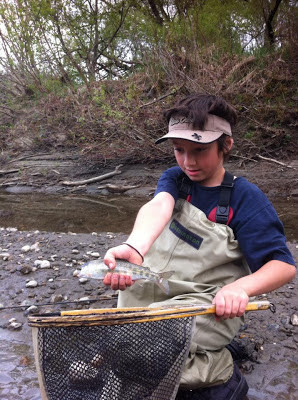 Vermont Dept of Fish and Wildlife will be hosting public hearings later this month to gather input in regards to some proposed regulation changes that would open up several miles of water to fishing between 11/1 and the 2nd week of April each year. It is also being proposed to change the brook trout limit from the obsurd 12 fish limit to 6 fish. Please take a moment to read the proposed changes in their entirety here and please find the time to attend one of the hearings in St. Johnsbury, Montpelier or Castleton. You can also send your comments to the Fish and Wildlife Board here.